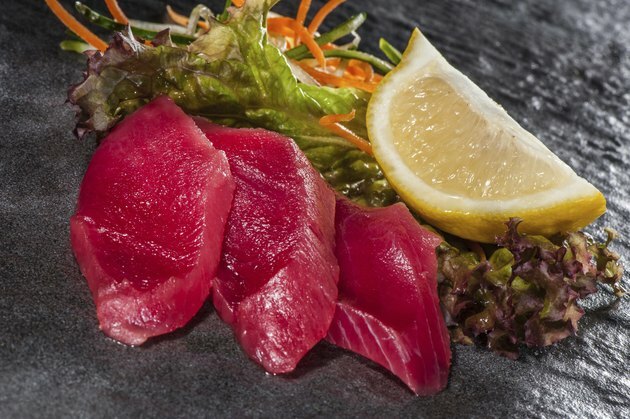 Fatty fish provides unsaturated fats, including omega-3 fatty acids, protein and several vitamins and minerals with relatively few calories and low saturated fat content. Tuna, like salmon, mackerel, trout, herring and sardines, is a fatty fish. The American Heart Association suggests having fatty fish at two or more meals every week. Tuna fillets are quick and easy to prepare a number of ways, including by baking them in the oven. Recipes are plentiful and varied, since tuna fillets are versatile enough to support a wide range of flavor accompaniments. Refrigerate the tuna fillets for at least 24 hours to thaw them if they're frozen. Rinse the tuna fillets with cold water and blot them dry with clean paper towels. Season, glaze or marinate the tuna fillets as you like them, or by following a chosen recipe. For a basic seasoning option, brush the tuna fillets with cooking oil, squirt them with lemon juice, and then dredge them in sea salt, freshly cracked black pepper and a favorite fresh herb or two. Grease a baking tray with cooking spray or oil. Place the tuna fillets on the tray without letting them touch each other or the sides of the tray. Place the tray on a middle tier in the oven. Bake the tuna fillets for four minutes per inch of thickness to cook them to rare, five minutes per inch for medium-rare or six minutes per inch for medium. Refrain from cooking them more, as they start to dry out past medium. Cooking times vary by a number of factors, so use a meat thermometer to determine when the tuna fillets are done. Take them out at 120 degrees Fahrenheit for rare, 130 degrees for medium-rare or 140 degrees for medium. Remove the tuna fillets from the baking tray with tongs or a spatula immediately to prevent overcooking. Serve them right away. For a simple tuna glaze, bring 3/4 cup of soy sauce and 1 tablespoon of honey to a boil, and then spoon it over the tuna fillets and spread it over them evenly. For an easy tuna marinade, soak the tuna fillets in red wine, soy sauce or a citrus juice for one to four hours in a covered glass baking dish in the refrigerator. Flip them over once halfway through.